Alcares ApS specialises in the development and production of SOLAS LED position-indicating lights for life-saving appliances. We offer a range of high-quality SOLAS marine rescue lights for lifejackets, survival suits, life rafts and buoys. Our products are approved and manufactured in compliance with the latest SOLAS / marine equipment directive (MED) requirements. Alcares ApS uses non-hazardous, environmentally friendly, alkaline-powered LED lights, which are much easier and cheaper to transport than their lithium-powered counterparts. Controlled with a manual on / off button, this water-activated light will continue to flash for several days. In automatic / dry mode, the button functions as a test button. When the button is pressed, the light flashes rapidly for a few seconds. The button then remains inactive for approximately a minute to discourage people from wasting the light. The light will turn on automatically if placed in contact with water. After being activated, the light stays on regardless of whether it remains in contact with the water. In this water-activated mode / wet mode, the button functions as a manual on / off button for a minimum of 24hr. If the jacket dries out after 24hr, the light will return to automatic mode. A version is also available for recessed lifejackets. This light is water-activated and equipped with a test button, which causes the light to flash rapidly in a short sequence when pressed. The light will turn on automatically when in contact with water. The light will turn off when lifted out of the water. The light is approved to heights above the water up to 72m, meeting requirements of very large ships. 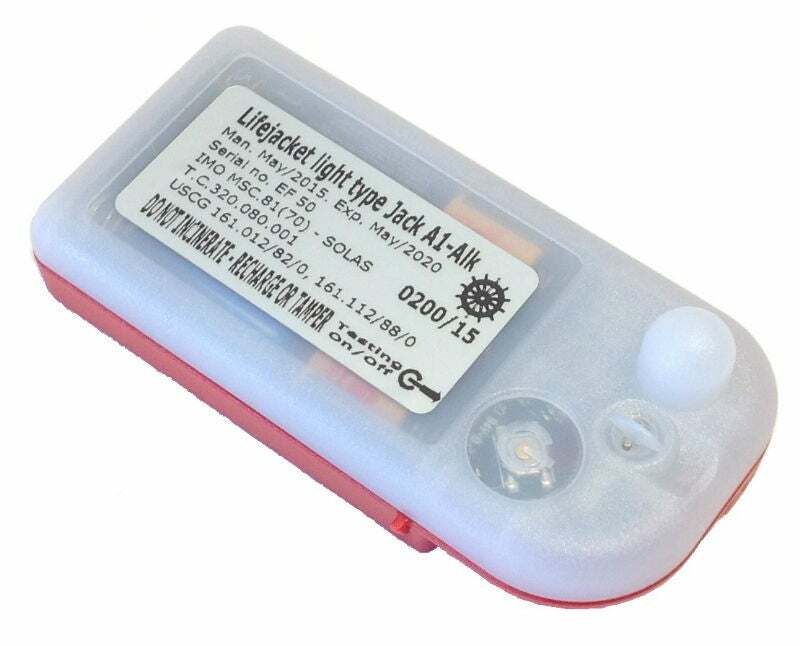 This light consists of three parts: battery / internal light, lead and external lamp. It is manually operated, with an internal constant light and an external flashing light. It is activated by moving the activation arm around the corner clockwise on the battery. The battery is to be installed in the raft in such a way that the clip, connected to the activation arm, pulls the arm around the corner when the raft inflates and activates the light. When the light is activated, the internal light can be turned off and on at the touch of a button. Alcares ApS is a manufacturer of SOLAS LED position-indicating lights for life-saving appliances. Alcares ApS is a family business owned by Hans Poul Alkjaer, Thomas Alkjaer and Christine Alkjaer. Hans Poul Alkjaer has more than 30 years experience in the business. Alcares ApS was founded in 2010 and has already experienced an impressive business development. Alcares ApS is situated in Denmark near Copenhagen. All lights are assembled here at our 400m² factory. We are ISO certified to ensure high-quality production and certification on all of our lights. Alcares ApS supplies products to the professional marine industry, cruise liners, military forces and the leisure market. With an almost worldwide distributor net, Alcares ApS products can easily be found in many countries. Our aim is to become the world’s leading manufacturer of marine emergency lights. With a fast assembly time, we can quickly adjust production to meet requirements and therefore deliver lights within a short timeframe, depending on the amount of lights required. When we give you a time for delivery, we commit ourselves to meeting that obligation. Safety is our top priority, with quality and performance checks taking place throughout the manufacturing process. We are always developing to ensure quality and low prices for our customers. Our customers’ opinions and suggestions are important to us and will be taken seriously. This free white paper download provides informaion about Alcares's BL-2H-Alk buoy light.